Modern Home Goods & Furniture. Whether you are looking to completely furnish a new home or simply update a single room, you can easily buy all of your furniture, window coverings and area rugs online. With the wonderful selection of fabrics and colors available today, I am sure you will find many great pieces to ‘feather your nest’ with. Geobeats invited me to create a number of different videos for their travel & lifestyle network on YouTube. I hope you find this one to be informative. Please give the video a thumbs up if you like it. Thanks! For a variety of furniture and home accessory items that will compliment your home decor and style of living. Check out their fabulous one-of-a-kind items too! “The world’s top home decor brands and designers at up to 70% off retail.” Sign up today for a $15 credit for purchases of $30 or more. Check out this gorgeous collection of Amy Butler wallpaper. A very cool collection of bedding, pillows, lighting, innovative wall coverings and more. 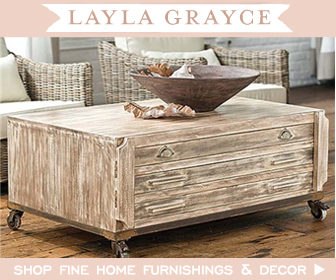 These wonderful shops have a wide selection of home furnishings and other accent pieces for your home. There is so much creative inspiration lurking on the web to make you want to tear down your house and start all over again. Whether you are looking to do a complete remodel or just spruce up a few rooms, these sites might be a fun place to start. We all love Amy Butler fabrics and now we can enjoy her brilliant colors and prints in her rug collection as well. They are available in many sizes so you can find just the right one for your home. The foundation to a great room is great flooring. Whether you opt for eco-friendly cork or a nice soft carpet, it will certainly set the stage for all of your great furniture and art work. These pretty sheers with lovely details will work great in so many different rooms. These are the curtains in my living room that I bought online from Anthropologie. I get so many compliments on them. I just tie them up with a ribbon to let the sunlight in.